Now that they've broken up with Funko, Super7 has started seeing Mattel on the side. They're in charge of releasing MotU figures these days, and are also borrowing the rights to MUSCLE. 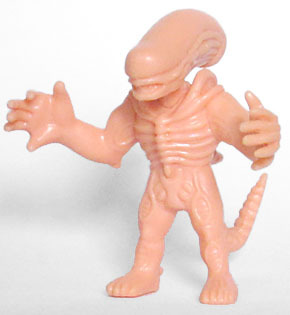 Sadly, no, they're not just re-releaing the imported Kinnikuman figurines, like we had in the '80s; rather, they're doing the licenses they have in MUSCLE style - licenses like Alien. There are four three-packs, each with completely unique assortments of figures inside - you don't have to worry about getting doubles if you buy them all. The packaging is a total throwback to the vintage MUSCLE packs, with the familiar yellow logo on a bright blue background, and instead of Muscleman leaping off the ropes, it's an Alien in the same pose. The back of the card, which in the '80s would have had different wrestlers trash-talking each other, here has an astronaut proclaiming "The Nostromo crew will deal with this strange alien menace!" and a xenomorph saying "................" - that's right, he's saying nothing. Xenos don't talk! The sets aren't numbered or anything, but there is a checklist on the back entreating us to COLLECT ALL TWELVE, so we'll just start on the top there and review the sets in the order one of the characters within shows up. Make sense? No? Who cares, here we go! Ash the android kickstarted the Alien franchise's tradition of naming its robots in alpabetical order - first Ash, then Bishop, then Call, then David. Of course, we're not meant to know he's a machine at first, just another random crewmember (the backup science officer, in fact). But after the alien is found, his programming takes over, and Special Order 937 dictates that he get a sample back to Earth, no matter what. Since a figure of Ash just standing around would be boring, he's sculpted with his right arm raised, holding a rolled-up magazine. No, he's not going to bop the Alien on the nose like a misbehaving puppy, he's going to try to suffocate Ripley with it (after the movie breaks the fourth wall). And hey, look, here's Ripley now! This is pre-Aliens- badassification Ripley, with the big, feathered hair and the grey jumpsuit. There was no indication that she would be the "final girl" of the film, and in fact was rather unlikeable: she was a stickler for the rules and seemed to be the one in the way of getting things done. Little did we know she was right all along! 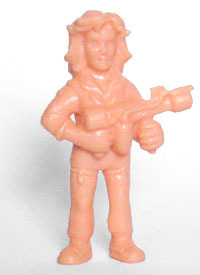 Her figure is slimmer than Ash's (like, literally the toy, not a commentary on the actress's physiology), but she's sculpted holding a flamthrower, ready to go out and hunt some alien! The pose isn't very exciting, but that's how some MUSCLE figures were - having her stand like a badass with the gun held away from her body just wouldn't have been accurate. 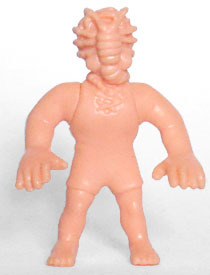 This set includes an Alien, and so its blister bulges out on one side to make room for the big chap. And boy, does he need it! Not only are his arms spread wide (in the most traditionally MUSCLE-ish pose imaginable), he's also got the dome head and the tail to contend with. It's always weird to see an Alien just standing around with flat feet, rather than lurking or crouching - it just makes him look more like a guy in a suit than a foreign creature. Still, with this Alien, plus Ripley and Ash? If you were only going to get one of these Alien MUSCLE sets, that would be the one to get. But we have three more to go, so hold onto your butts! MUSCLE was a line of wrestler toys, and now we've got one named Kane? WWE's gonna sue somebody! 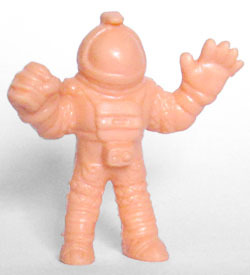 Although, in all honesty, we're just taking the checklist's word for it that this is Kane at all - the entire crew of the Nostromo had identical space suits (save for the color), so molded in pink plastic, this could be any of them. Though for the record, Dallas was the one who had a pink suit in the movie. The helmet is solid here, so we don't have any likeness to worry about, and Kane has that classic MUSCLE pose, with both arms held up slightly to accommodate fighting play. The suit is detailed surprisingly well for the size, right down to the texture on the soft parts. Next we have the ship's chief engineer, Montgomery Scott Dennis Parker. He's the big guy on the crew, the ship's muscle. And now he's a MUSCLE! Fun! He's no dummy, either, because he doesn't want to investigate LV-426 at all, and then he doesn't want to waste any time talking, but rather kill the Alien right away. He even jury-rigs flamethrowers for himself and his buddy Brett! Parker was played by Yaphet Kotto, who has the distinction of being the first black actor to ever be shown killing a white character in an American film. 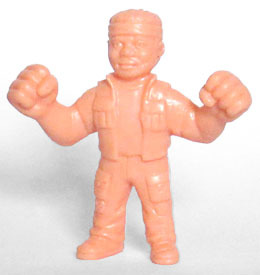 MUSCLEs have cartoony likenesses (which is why Super7 is able to do so many characters NECA can't), but Parker can easily be recognized by the headband he wears. He's also in that same "arms up" pose, but unlike Kane, both his hands are balled into fists. Parker's gonna go down fighting! And finally, we have the thing that started all the trouble, an "ovomorph." Rather than a free-standing facehugger to crawl around on the ground (as never happened in the movie, this one is just emerging from its egg, jumping up like a jack-in-the-box. 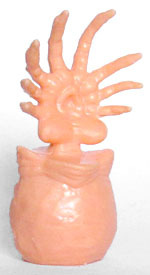 That allows it to be as tall as the other figures, and means both the "mouth" and "back" sides are visible depending on which way you want it to face. The egg itself has a bit of a lumpy texture, which is accurate, and the hugger has its segmented finger-legs spread wide. So gross! The four "petals" on the eggs opening are here, but the inside is solid, not hollow - that's not surprising at all, it's just worth mentioning. Hey look, here's Parker's assistant! Brett is a simple technician on the Nostromo, and is clearly the lowest man on the totem pole - everybody gives him crap, and he gets all the buttmonkey jobs. Ship's mascot cat goes missing? Let's send Brett to go find it! It's not like he's doing anything important, right? Right. He was played by Bryce Dallas Howard... no, that can't possibly be right. 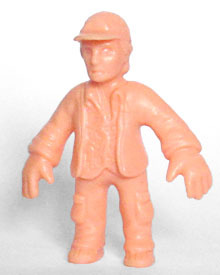 He was played by Harry Dean Stanton, though this toy looks almost nothing like him - if not for his ballcap and his rumpled Hawaiian shirt (with sculpted flower pattern) you'd be hard-pressed to figure out who he was. He's posed with his hands down by his side, though his arms are still held away from the body slightly. Hey, Kane's back! And this time he's in his underwear! 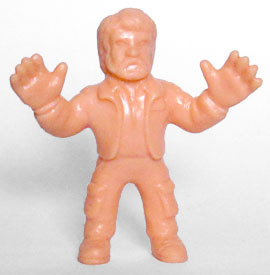 This figure still doesn't have a likeness, because his head is shrouded in a facehugger - it's much smaller here on his head than it was standing on its own in the last pack, but such is the reality of a stylized line like MUSCLE. This is clearly after he's been brought back onto the ship (in violation of quarantine protocols) and is being examined by Ash, our friendly hu-man doctor. I'm not sure why they chose to pose him with his arms held slightly in front of him - this toy depicts him when he's laid out on the exam table, so shouldn't his arms be more relaxed than this? 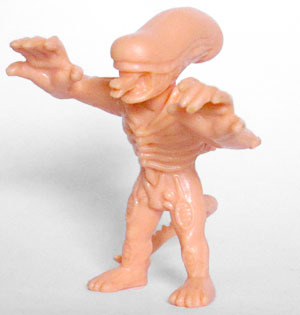 This pack also includes an Alien, but it's not the same as the one in Pack A: its arms are held higher, in more of an "attacking" pose than a "let's hug" pose. The tail curves down and to the left, instead of up and to the right and, oh yeah, this one has his inner mouth extended. So basically, not a single bit of this figure's mold is shared with the other Alien. They do both have nice sculpts, with raised ribs, flutes on the back, the appropriate textures on thigh and biceps, and even the extra thumb on the bottom of each hand. The body is thicker than an actual Alien is, but if it were appropriately skinny, it might not be able to support its own weight. When Alien was being written, none of the characters were given any gender, because it didn't matter - they were all just fodder for the Alien. Famously, "Ripley" was a man right up until Sigourney Weaver was cast, then they did a find/replace on the pronouns and called it a day. Additionally, in the character backgrounds Ridley Scott created, it was revealed that ship's navigator Lambert was trans, with the idea being that while in space, no one can hear you scream, in the future, no one cares what gender you are. Lambert was the decoy protagonist of the film, the one the audience was supposed to identify with, which is why her death was such a shock (even if she did go all "deer in the headlights" when seeing the Alien). She's sculpted with her arms up and her hands open, like all the figures in this pack are. Hey, Kane's back! Again! But not for long, because this one has a chestburster popping out of him. Hey, at least we finally get to see his face, right? 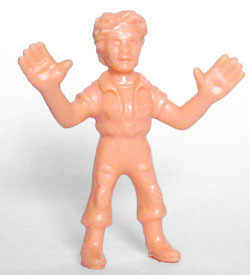 If you were just going by this toyline, you'd assume Kane was the star of the film: even the titular Alien only gets two figures, while Kane's gotten three! Okay, maybe the Alien has two and a half, since the chestburster molded on this one is technically him, too. Kane has shaggy hair, and an appropriate grimmace on his face. The blood on his chest is a sculpted element, because otherwise there's no way we'd know it was there on these unpainted toys. Contrary to rumor, the chestburster scene was not a surprise to the other actors - that kind of effect takes a lot of time to set up - and what's seen in the movie is the second take: the first take was more restrained and low-key, so the actors would lean in close, and then the pressure on the blood geyser was cranked way up. Our final figure is Dallas, the captain of the Nostromo and the guy who, in a different kind of movie, would have been the big-time action hero. Think about every decision he makes, and imagine the captain in an action movie doing the same thing: he wants to leave the planet as fast as possible, he wants to ignore procedure to get his injured crewman back on board, he volunteers to be bait and go into the vents alone... basically, if the Alien universe were a less cynical place, he'd have been Space John McClane. [Well, his last name is "Dallas," so... --ed.] Allegedly he was also identified as trans in Ridley's notes, and he was once employed by Blade Runner's Tyrell Corporation. 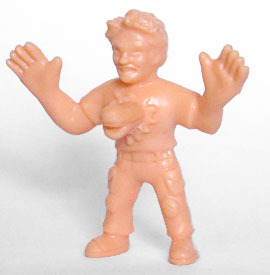 The figurine is sculpted with Tom Skerritt's mighty '70s beard, and he's wearing a jacket over his jumpsuit. If you find these Alien-themed MUSCLE toys whet your appetite, there's also a series based on Aliens - including a Queen and a Power Loader! 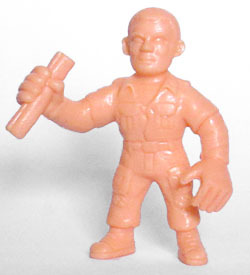 The cost of $2 per figure is a little bit high for unarticulated, unpainted lumps of rubber, but licensing fees (to both 20th Century Fox and Mattel) have to go somewhere, and Super7's toys are always a little overpriced anyway. But after years of stand-ins, it's nice to have legtimate MUSCLE back again.